Get to know the Andalusian countryside on this half-day hike in Marbella. Traverse the forests and discover the flora, fauna, and rock formations of the area. Learn about the region’s history from your tour guide as you pass Moorish castles, Roman ruins, and prehistoric caves. 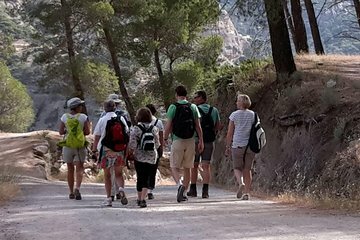 Spend the day in the great outdoors with a small group of eight guests or less and get to know the rural life of Spain. Your Hotel between Manilva and Marbella, it must be near the main road, and not further east then Cañada Shopping Center Marbella. If in the old town, we arrange meeting point close by. between 8:30 to 9:30 according to location.